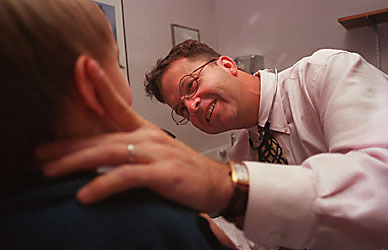 Dr. Chris Cuniff diagnoses children with FAS. He is shown here during a routine exam at UMC. They fade into the crowd, getting lost in a world that cannot understand them. Fetal alcohol syndrome is not a problem only for children. Disabilities follow adults through life. Most cannot make it alone. "People don't grow out of FAS," said Gail Harris, who has worked with people with prenatal alcohol damage since the 1970s. "What are we creating in terms of who will run this democracy? Many of these people need lifelong supported living." Research released last year by the University of Washington showed that of 415 people with FAS and FAE studied throughout the country, none of the men with FAE was able to live independently. Only 20 percent of the men with FAS were able to live on their own. Most women in the study also couldn't live without support. The facial features that mark children with FAS tend to fade in adulthood, leading to expectations that are unrealistic. Dr. Christopher Cunniff, a pediatrician and geneticist at University Medical Center, said FAS is considered a pediatric disease and is undiagnosed in many adults. "The appearance is different in adulthood," he said. "It's not as obvious. What we need to do is study the way it looks in adults." He said adults with FAS are expected to function, but cannot. "A lot of these folks end up being very close to homeless," said Susan Guinn-Lahm, who helps provide services to disabled people through the Department of Economic Security's Division of Developmental Disabilities. "I would bet a lot of people on the streets have FAS," she said. Guinn-Lahm said many adults end up alone and in trouble. "Because of a lack of understanding of consequences, they've alienated families and don't have any support," she said. "Parents and relatives and friends tend to desert them. Their self-esteem is so low, they develop mental health issues. When self-esteem is so damaged, depression is very, very real for these people." More than 90 percent of adults with FAS and FAE suffer mental health problems. "The low self-esteem makes them so hungry for attention and affection," Guinn-Lahm said. "They give their money away, trying to make friends. Women tend to go with any man they see. Being a victim is better than not having any attention." Men and women are victimized sexually, she said, and some cannot live in group homes because of promiscuity. Women with FAS have a difficult time remembering to use birth control, and some long to have children. "Some think a baby would be a source of affection, somebody to love," Guinn-Lahm said. "But they have not a clue how to take care of a baby."